I’ve never been a ‘fan’ of UK-based ‘SA Promo Magazine’ – online or on social media – as I’ve long felt the editor promotes an almost racist agenda via his/her biased ‘news’ service. In the past, when my friends on Facebook suggested I ‘like’ the FB page for SA Promo, I’ve ignored it and when I see the odd tweet originating via SA Promo, I also skip it. 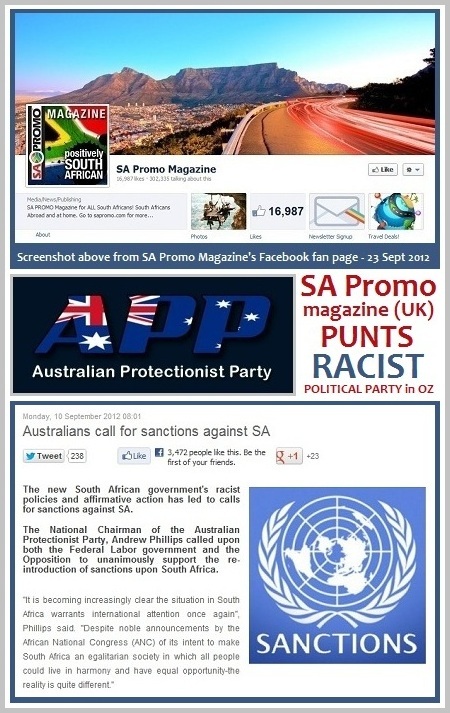 However – this last week, I saw many people sharing and discussing a news post – actively promoted by SA Promo – about a far-right Australian political party calling for Aussie sanctions against South Africa because of our government’s supposed “racist policies and affirmative action”. I then saw red because the Australian Protection Party promotes “separate development” in their country, which is – after all – the basis of the argument that the Nationalist government of SA used over homelands and other policies in the 1970’s and 1980’s! What staggered me was how viral the SA Promo post went within days, particularly in SA on Facebook, although I assumed a fair degree of their supporters were SA ex-pats living in the UK, Australia and further afield … after all, some of them left South Africa post-1994 to avoid living under so-called “majority rule”! When one understands the context of it all, then one sees how damaging SA Promo’s action is, in terms “promoting South Africa” more widely, specifically in terms of trade and investment and heightened spin-offs of the country’s risk profile, coupled with its own need for much better ‘social cohesion’. The APP (Australian Protection Party) was resurrected 5 years ago, having effectively been a colonialist, governing party over a century ago. * It has – as I write – 1113 members on its Facebook page. * In the 2010 federal government elections, a co-founder stood for a seat in the senate and garnered 0,03% of the total vote – 1501 votes to be precise. * A senior office-bearer in New South Wales recently stood in a municipal election and secured 0,6% of the vote. * A few months ago, the Australian government held a rally in Belmore Park in Sydney to focus on welcoming new immigrants to Australia and the APP decided to protest against it. They set up an event (“Torpedo the boats”) via their Facebook page to counter this whole issue of immigration and – reportedly – 150 or so supporters committed to attending. Less than 10 people showed up for the protest, whilst thousands of people flocked to an apparently ‘Welcome to Australia” event in the park. It is promoted on their website and on Facebook and Twitter – 96 likes, to date, on the former, and 10 tweets on the latter. Mainstream media Oz completely ignores this statement and I can find no credible publication or comment anywhere around that time. According to its website (www.sapromo.com), UK-based SA Promo – depending on SA news and events – can achieve almost 100 000 unique visitors in a month. As at today, it has almost 17 000 Facebook fans and about 12 000 followers on Twitter. The few copies of the weekly SA Promo magazine I’ve read online generally have news from government’s news sources and a few re-hashed stories, but nothing overly positive – except when SA does well at the rugby or Olympics/Paralympics – even though their Facebook page logo brags “positively SOUTH AFRICAN”. It is from their daily news feeds, Facebook posts and tweets that one gets a clear direction of deliberate negativity surrounding national affairs. The Woolworths ’employment equity’ issue, for example, was trumpeted everywhere and SA Promo then also actively promoted the AAA Anti-Affirmative Action page on Facebook. Within days, it had well over 2500 “likes” on Facebook and a couple of hundred tweets. The story is then widely spread via social media and is virally picked up by right-wing bloggers and posters in many countries. If SA Promo is “positively” promoting anything South African – and multiculturalism is part of exactly who we are – how on this rich, bountiful earth – can SA Promo effectively give the APP more than THIRTY times the social media coverage worldwide than its 7-month old media statement achieved? Is that what SA Promo wants – to promote far-right political agendas? Given South African domestic tensions over such sensitive issues as Marikana, social inequality and employment equity recently, I cannot, for the life of me, fathom how a “positively SOUTH AFRICA” enterprise, based in the UK, would see fit to drag up a long-forgotten media statement from a totally irrelevant far-right party in Australia, unless it was to stir up a hornet’s nest inside SA around issues of racism. I certainly would have “dis-liked” SA Promo’s Facebook page by now if I had erred in “liking” it previously and I certainly would ignore their news, definitely not support them as an advertiser and certainly not buy a single South African product through their online store. However – we live in a democracy and people have the freedom of choice, voice and association, which – I must hasten to point out – our current government gave to ALL our people on 27 April 1994 and the previous government denied such rights to the overwhelming majority of our population over the preceding decades and centuries. Hi Brian, You make some interesting points and have obviously spent a great deal of time to get some numbers together. Well done. I also have to point out that the article went viral for a good reason. There are a lot of patient folks out there. This you still need to figure out. Thanks, Dean, for your input. We have more than 20 million registered voters in SA, yet – when I wrote here – SA Promos had just over 2500 ‘fans’ via FB for this post. It now has 3961. And many of them or non-residents or non-South Africans. So – on a simple assumption of possibly around 2000 ‘active’ South African electors speaking out by endorsing this emotive rhetoric, I estimate that SA Promos has perhaps secured one-hundreth of one percent of our total registered voters for this campaign. Having figured this out, I must admit to being lost at your point. The ‘figures’ seem quite inconsequential. However, what irks me more, is an organization that purportedly ‘flies’ our flag – on foreign lands – and so derives commercial profits from our brands and trade links. To me, it’s akin to ‘spitting’ on your own family. But hey – everyone has a right to freedom of speech. I’m simply glad that the freedoms we’ve won, and continue to actively champion here in our land are cherished by a vast majority of our people, who choose to act in a responsible and accountable manner, when exercising their democratic rights. Sadly ‘ex-pats’ don’t show the same maturity.